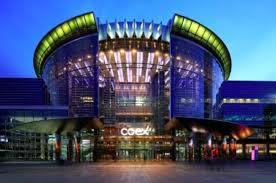 Coex is a business and cultural hub located in the heart of Gangnam, Seoul’s business district. It is a popular entertainment destination in Seoul for both domestic and foreign visitors, and welcomes an average of 150,000 people a day. Asia’s largest underground mall, three five-star hotels, two premier office towers, a department store, a subway station, an airport terminal, and more are all located at Coex. Coex is also Korea’s top business events destination. The Coex Convention and Exhibition Center itself is a four-floor meetings venue with over 450,000㎡ of total floor space. There are over 200 exhibitions and 2,000 conferences here each year.